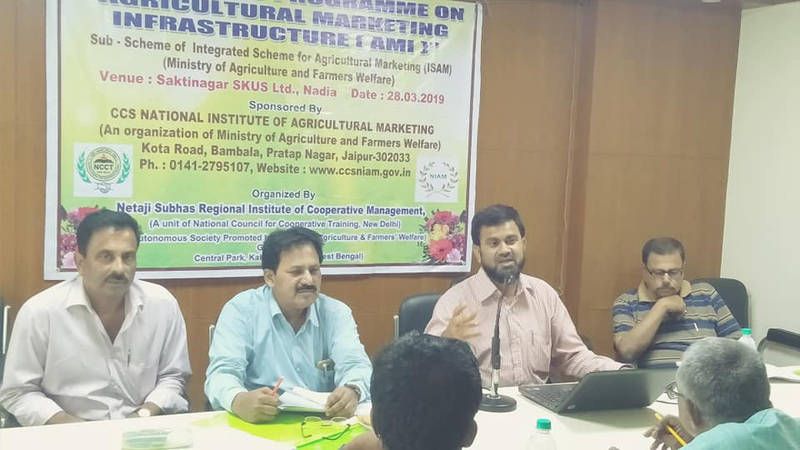 N.S.R.I.C.M., Kalyani West Bengal recently organized an awareness program to sensitize farmers to various Concepts of Agricultural Marketing Infrastructure schemes (under Integrated Scheme for Agricultural Marketing). The event was sponsored by National Institute of Agriculture Marketing. 40 farmers and members of APMCs and cooperatives took part in the training program, informs the press release issued by N.S.R.I.C.M. While opening the event Program Director of N,S,R.I.C.M, Dr. I. A. Khan explained the aims of the training program including the importance of Agriculture Marketing Infrastructure and production of various crops so farmers taking part in the program could benefit from this training program. After the Inaugural Session, there were detailed discussions about “Agricultural Produce, Marketing Infrastructure, Resource Mobilisation, Vision and Mission of Agriculture Marketing Infrastructure Scheme & Govt of India’s schemes for the beneficiaries.